Saman Wijayabandara -Mawanella Special Corr. The Pinnawala Elephant Orphanage which is a major tourist attraction is losing out to private elephant owners in the vicinity. The orphanage, launched in 1975, attracted hordes of tourists in the past. Tourists particularly enjoyed the elephant bath and feeding baby elephants. 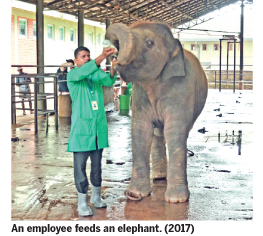 However, the number of tourists visiting the orphanage has been diminishing since private elephant owners along the Kegalle - Pinnawala road have used various ruses to get tourists to visit their sheds instead of the orphanage. They have also teamed up to prevent the orphanage from getting new baby elephants for its care. Tourist guides too are in league with these private owners due to the heavy tips they get. Some of them said there is nothing interesting at the orphanage for the entry fee of Rs. 2,500 charged for each foreign tourist. Moreover, the orphanage does not get many baby elephants for its care since most baby elephants are sent to the Uda Walawe transit home which gets preference. There is also a decrease in baby elephants because the orphanage has now stopped the elephant breeding programme, according to some employees at the facility. The Pinnawala orphanage was launched under a concept of late Minister P.B.G. Kalugalle. It was vested with the Department of Zoological Gardens in 1987. Reports said the orphanage now has a herd of nearly 80 elephants. When contacted, the orphanage’s Deputy Director Renuka Bandaranayake said she could not comment on the issue without approval from higher authorities.